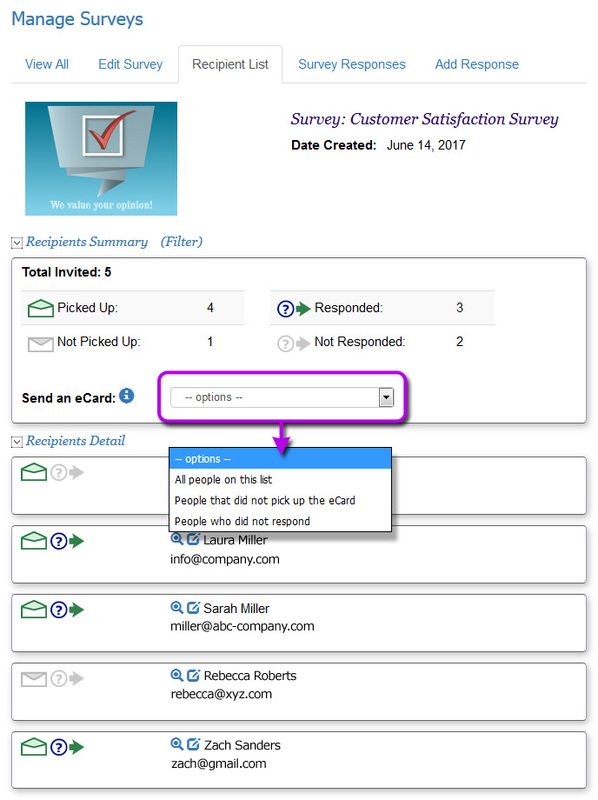 Each time you send an eCard with a survey, your recipients are automatically added to a consolidated recipient list for that survey. 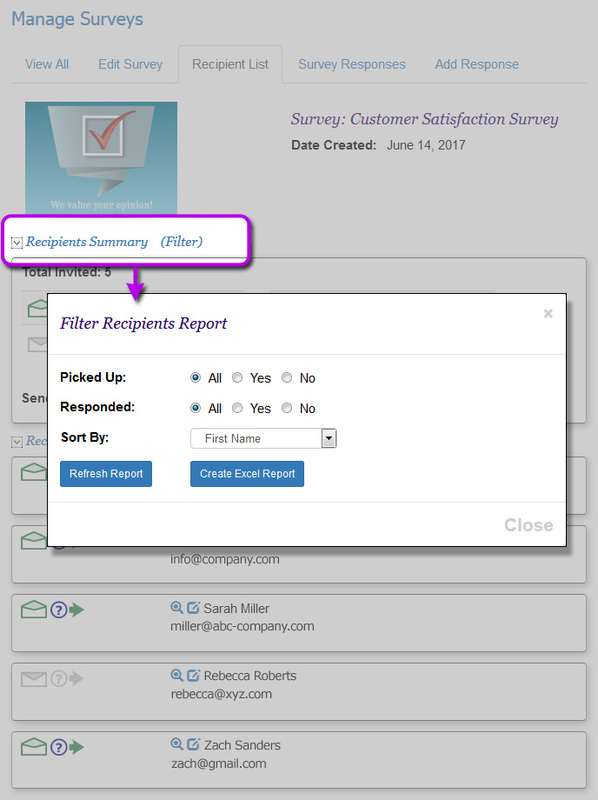 Even if you send multiple eCards for a survey, this consolidated recipient list enables you to easily further correspond with all of the people you asked to respond. 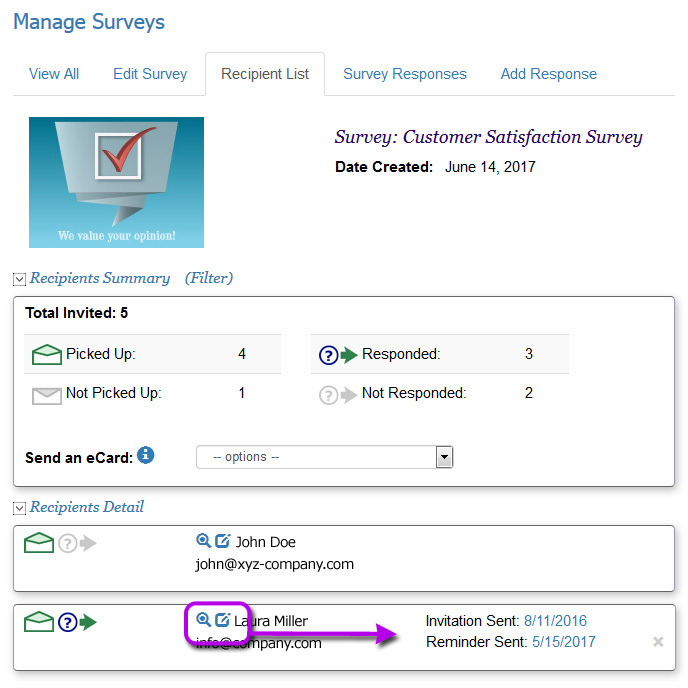 Your 'Recipient List' is your survey 'mailing' list which contains information on each person you invited to take your survey. This list includes information for each person such as when you sent the survey to them, whether the person viewed your eCard, if you sent them a reminder and whether they responded to your survey. In the navigation, go to Surveys > Manage Surveys. In the options menu next to any survey, choose "Recipient List". At the top of the page, you will see a statistics overview with options. You can view in real-time how many people viewed the eCard with the survey and how many responded. The follow up eCard will be created with the appropriate recipients added to the address list. If you did not select a template: you will be able to create your eCard as usual. 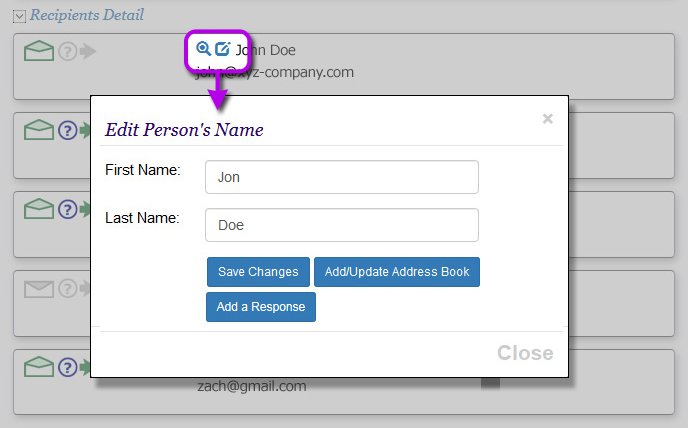 You will need to select a design and compose your message. If you selected a template: you will see the message screen where you can edit your eCard without affecting the original template. The address and send screen will have the chosen recipients in the address list such as people who did not respond to the original eCard with the survey. You can either send this follow-up eCard immediately or schedule it to be sent on a future date. The follow up eCard will be easily identifiable in your Saved or Sent eCards bin. It will have the 'follow up created' date as well as auto generated comments so you know the day you created the follow up, when it was sent and to whom (see example). 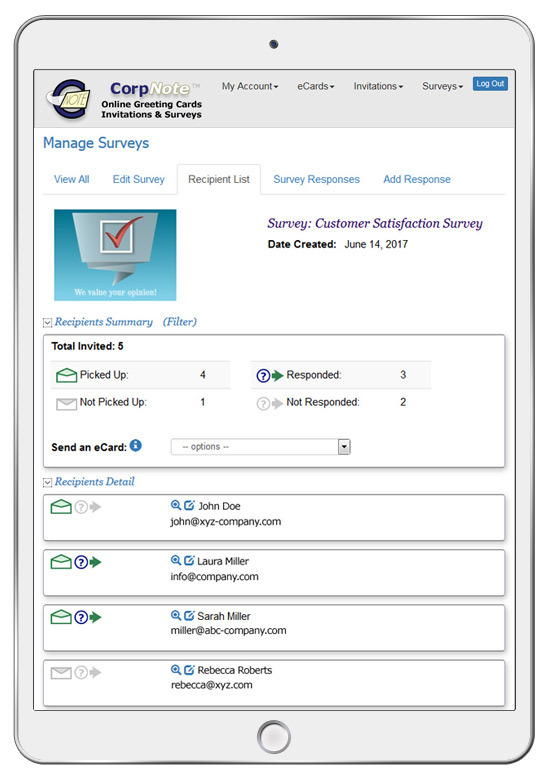 Click on the response icon to quickly view that person's answers to your survey. (see example). Click the view icon next to a person's name to see when you sent the survey to them and when you last sent a reminder (see example). change the person's first or last name. This is helpful if you sent an invitation to someone not in your address book and you want to better identify them in your list (see example). click the 'Add a Response' button if you want to enter survey responses for someone. When you do this, the recipient will be recorded as having received and responded to the survey. This ensures that the person will not be included on future "follow up" eCards for people who "did not" respond. The instructions to copy a recipient list from one survey to another survey are similar to the instructions for sending a follow-up eCard as described above. Go to Manage Surveys and select 'Recipient List' from the drop-down menu next to the survey that has the recipients you want to copy. 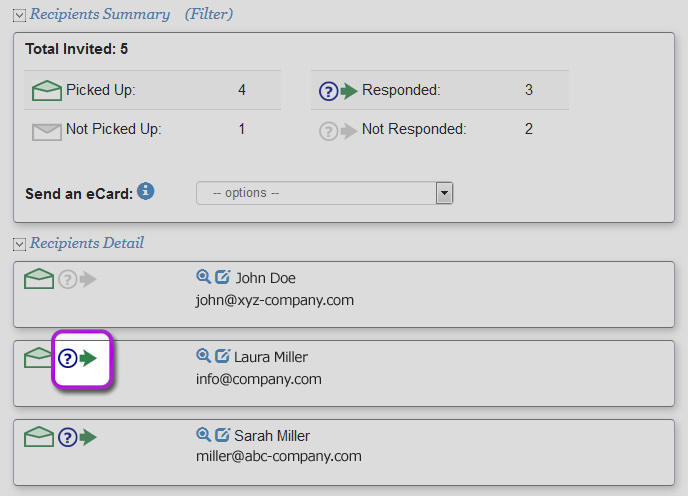 Click the options dropdown menu next to 'Send an eCard' and select all of the people on your recipient list. You can then choose an eCard template with the new survey you want to send them or leave the option as 'none' to create a new survey eCard. If you create a new eCard, make sure you select your new survey to be associated with this eCard. Your new eCard will be pre-addressed to all the people that you sent the other survey to. You can either send this eCard immediately or schedule it to be sent. This new eCard will be identifiable in your Saved or Sent eCards bin with the 'follow up created' date as well as auto generated comments so you know the day you created the follow up, when it was sent and to whom. You should modify the comments so you can more easily identify this card in the future.